The last thing anyone can call the 2017 Dodge Charger is boring. Everything about it, from the looks to engine performance, fills your heart and soul with excitement. This year, the Charger takes its inspiration from the Daytona racecar model that came out in the late 60s. It’s hard for any four-door sedan to capture the attention of its buyers as the Charger has done. Yet the Charger is no ordinary four-door sedan. It’s a cross between a muscle car and a family vehicle that stuns us with its spectacular driving performance and enchants us with its glorious luxury comforts. If there’s any vehicle that blends the traditional with the post-modern in an utterly effortless way, it is the 2017 Dodge Charger. Edmonton drivers would love everything about it from the engine options to the available equipment and from the stylish muscular appearance to the quality of the drive. It is truly a vehicle like no other. It has a heart and soul that many other vehicles in its class woefully lack. The two available models of the 2017 Dodge Charger come with two different eight-cylinder engine options. If you go for the standard Daytona version, you get a 5.7-liter Hemi V8 that packs a 370 horsepower punch with 395 pounds per feet of torque. It’s impressive enough when considered on its own. But even the superior performance of the 5.7-liter engine pales in comparison with the glory of the 6.4-liter V8 that comes with the Daytona 392 version. This is a powerhouse of an engine that ups the available horsepower to around 485, with 475 pounds per feet of torque. Both of the engine options come with an excellent eight-speed automatic transmission. It’s clear that, when it comes to the engines themselves, the Charger doesn’t want to mess with all the qualities of the previous models. But there’s still a lot of room for innovation here. And Dodge does not miss the opportunity. It complements the engines with a conical MOPAR air intake and an electronically adjustable 2.75-inch exhaust system. Like the 2017 A/T models of the Dodge Challenger, the Charger also comes with the Super Track Pack which elevates the driving performance of the vehicle to a whole new level. There’s a much stronger suspension, high-performance brake linings, an extremely effective stability control system with three different performance modes and an off switch. Topping it all off are the stronger and sturdier Goodyear Eagle F1 tires that ensure a firm grip, no matter what the conditions are. There are two available wheel options. The 20 x 9 inch wheels are standard on the base model. And if you go for the Daytona 392, you get the even wider 20 x 9.5 inch ones. Even though there are only two models, there are still plenty of options in the 2017 Dodge Challenger. Edmonton drivers will have a great time choosing between the two. Although there are no major structural changes from the previous models, this year’s Dodge Charger does take up a character of its own. In that sense, in terms of external appearance, it has more in common with the Challenger than it has with its previous model. The distinctive appearance of the 2017 Charger is inspired, in part, by the 1969 Daytona and, in part, by Dodge’s own Hellcat. The distinctive appearance of the Charger comes largely from the black decals on the roof, hood, and rear panels. And although the same can be said about the Challenger A/T models, the Charger also has additional graphics on the hood-scoop bulge and the rear quarter panels. When it comes to the interior of the 2017 Dodge Charger, Edmonton families will find plenty to like here. There’s a blend of luxury and comfort that defines the Charger’s cabin. It invites you in and makes you want to stay there. There’s plenty of branding on the interior as well. From the Daytona logos on the front row seats to the Daytona badge on the instrument panel, this year’s Charger tries to be as distinctive as possible without making any radical changes. The heated and ventilated front seats are power-adjustable. If you’re willing to spend a bit more on the interior, you can get features like a power-adjustable steering, rear parking sensors, and LED lighting for the interior. There’s plenty of standard and optional equipment in this year’s version of the Dodge Charger. Edmonton buyers will love some of the newer options that are on offer here. There’s a much more impressive version of an infotainment with exciting new features like Android Auto and Apple CarPlay. The touchscreen interface is more responsive and interactive. The houndstooth material of the seats makes the driving experience much more comfortable. The 2017 Dodge Charger is everything a sedan wants, and ultimately fails, to be. It’s the best you can have in this price range, and that’s saying something. 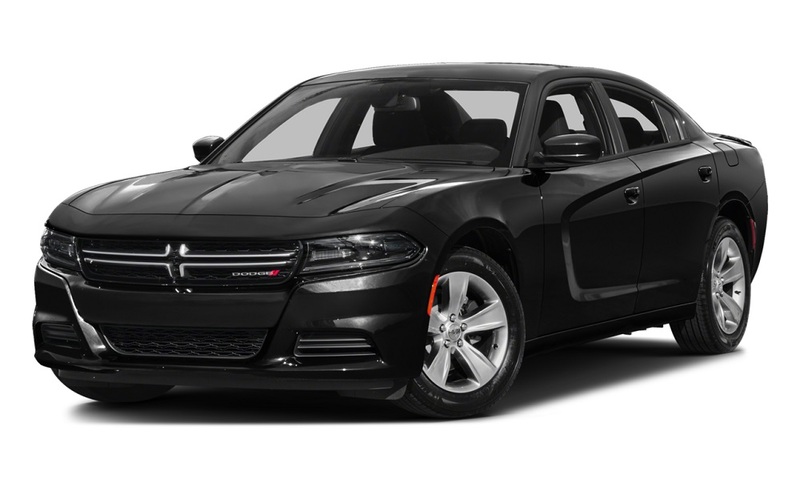 If you want a family vehicle that looks gorgeous in the garage and performs even better on the streets, there can be no better option than the Dodge Charger. Edmonton car purists would love the blend of tradition and innovation that it offers. We hope the 2017 Dodge Charger has you eager to get behind the wheel; St. Albert and Edmonton drivers can take a test drive seven days a week at Derrick Dodge. We’re at 6211 104th St in Edmonton, AB. Contact us online or by phone at 780-435-3611 if you have any questions or want to schedule your test drive of the Charger.